In this ongoing blog, we will share with you what’s happening at PWSA (USA) today including ideas for spreading awareness, important information on resources and strategies for supporting people living with Prader-Willi syndrome (PWS), encouragement for families raising a child with PWS, updates on advocacy issues, work we are doing in partnership with others, and more. So I hope you will be a regular reader of this blog. Appropriately, though, this first blog post will address the importance of spreading PWS awareness. Right now, we are in the exciting midst of our first PWSA (USA) sponsored national campaign to generate PWS awareness called Prader-Willi Syndrome On The Move. 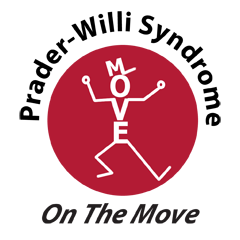 The very popular PWS On The Move character shown below is fast becoming the symbol of PWS Awareness month. We hope this symbolism will grow in the years ahead as, with your help, we continue to develop and strengthen what we hope will be a signature PWS awareness campaign. This year, because it is our first campaign, we are recognizing awareness events beyond the month of May so if you would like to participate please contact Ben Karp (800-926-4730 or bkarp@pwsausa.org) to find out how you, your friends, and family can create an awareness event for your community. What it would be like to be hungry all the time. What it is like to gain weight on fewer calories than typically developing people. What it is like to live with low muscle tone, a higher threshold of pain, and cognitive challenges. What it is like to struggle more than others with transition and change. What is like to live in a world where too often people respond to Prader-Wllli syndrome with little or no understanding of what it means. Food security at home, school and other important life settings. Educational resources – to support learning – such as paraprofessional assistance at school. Support services – across the board –to maximize independence, encourage socialization, promote employment, and more. Insurance companies and health care systems that address the complex needs of PWS without wait listing and denial of essential services. Continued innovative research into the causes of PWS and effective treatments. Communities that welcome people with PWS for social and other community activities so families raising a child with PWS are not living in isolation. Legislators and policy makers with an understanding of PWS and the needs of people who live with this complex syndrome. Our fervent hope is that the more people imagine what it means to live with PWS the more people – beyond the PWS community – will feel inspired to join our effort to create the kind of society and communities where people with PWS, and their families, can thrive and flourish. So this is why we are calling for the PWS community to keep on the move together to stir the imagination of our neighbors, our friends, our co-workers, our community members, our political and governmental leaders, and ourselves to imagine the possibilities of the world we can create for people living with PWS by being On The Move together. If you have joined the campaign already, we thank you. If you are thinking about it, we invite you to join us today or in the future. And whatever you are doing to spread PWS awareness in your own sphere of influence, keep it up! Together, we are making a difference in the lives of people and families living with PWS. This entry was posted in Uncategorized and tagged Awareness, Prader-Willi Syndrome, Prader-Willi Syndrome Association (USA), Prader-Willi Syndrome on the Move. Bookmark the permalink. I wish this was around when I was growing up. My brother has p.w. he has a higher tolerance for pain though. Thanks for the new blog! Thanks for this blog. I have a 14 month old granddaughter with PWS and we are trying to learn everything we can about this syndrome. I am sure this will be very helpful to my family. I am the name sake grandfather of Becky’s 14 month soon to be 15 month old Granddaughter. This little person has galvanized our two families to work together toward one goal, the best life possible for her. But this experience has also been a eye opener to a plight I had no idea even existed. I said from the moment we finally got answers to some very frustrating questions, that she is a gift, and maybe a gift just to make us better people. Let me know how I can help. Great for us to continue to have means to reach our families and show support, guidance n answers. Someone is always here for you. My son is 28, There is so much more now, it is wonderfu. My 12 year old son, Kyle, has PWS, Autism and is Profoundly Mentally Handicapped. We have went through many obstacles, behavior issues, trial and error processes and brick walls but Kyle is such a blessing in my life I love him just the way he is and can only pray he will be able to share his feelings on all he has been through one day. With hard work and a good support team there is no limit to what he will be capable of one day. My son, Kyle has PWS, is Autistic and Profoundly Mentally Handicapped. He has been through so much in the last 12 years. We have went through so many brick walls to get to where we are. Behavior Issues, Injections of Growth Hormone Therapy, Medications, Multiple GI issues including a fundoplication, complications galore and therapies of course, but, he is a loving wonderful blessing and I love him unconditionally. This child has brought so much and opened so many eyes to these complicated issues I wouldn’t even know where to start to explain. My concern is only for what will happen when I am no longer around to advocate or make the necessary choices for his ongoing mental, physical and emotional needs. Good to be able to share with other parents and caregivers. Hi, I have a daughter who is 30 years old. We live in Missouri and are looking for other individuals who may be looking for residential placement in a group home or an ISL. My 5 month old grandaughter was just diagnosed with Prader-Willi Syndrome. I am a retired nurse, and suspected FTT or Downs Syndrome. Please keep me informed and in the loop with current meds, environmental helps, etc.